The buying season has begun! Ladies here at The Wedding HQ we are passionate about providing our brides with only the finest bridal gowns. Over the month of march The HQ team have been to Amsterdam, Cambridge and London in search of only the most stunning gowns for store. We are passionate to find you your dream dresses. 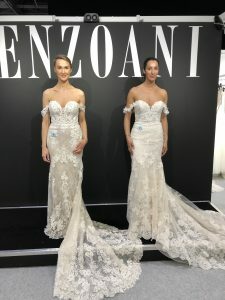 We look into fine detail at each dress from our different designers and critic each gown to make sure that only the most spectacular make it into store! We have some stunning gowns arriving in from Essence of Australia, Mark Lesley, Enzoani Blue and Martin Thornburg. Our aim is to provide Brides of the East Midlands a stunning array of wedding dresses from top bridal design houses. Ladies Bardot off the shoulder gowns are so hot on the catwalk for 2020! We have a stunning array of these gowns arriving in store. Could one be your dream wedding dress? Ladies do you love Crepe but want a ball gown? No worries we have found you just the dress. After seeing crepe take off in a massive way we are now pushing boundaries to see what other silhouettes this stunning fabric will look phenomenal in. 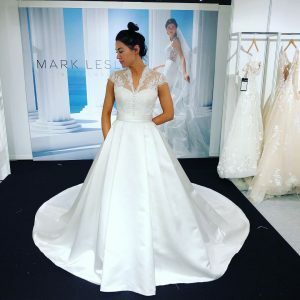 We are extremely passionate here at The Wedding HQ to make sure that every bride that walks through our doors can find their dream dress no what what shape or size. We have stunning gowns in store up to a size 30 and we can order up to a size 36. We want to make sure that you feel so beautiful in your dream dress! 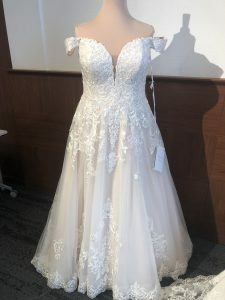 We have lots of new 2020 EveryBody EveryBride plus size gowns starting from a size 18 up to a 30 coming into store our Nottinghamshire boutique soon! So ladies if you are based in Derby, Nottingham, Sheffield, Chesterfield, Mansfield, Lincoln or anywhere in the midlands pay us a visit as your dream dress awaits! New gowns start at £900 and go to £2000. We also have a ready to wear collection which start at £500. So no matter what you style or budget we have a gown for you! Book your appointment 01623 238081! Lauren’s top tips to make the most of your bridal appointment!